while the menu at itsu has a lot of icky fish on it, they do have some great vegan options that are a welcome break from all the heavy chips and curry i’m used to consuming while in the uk. 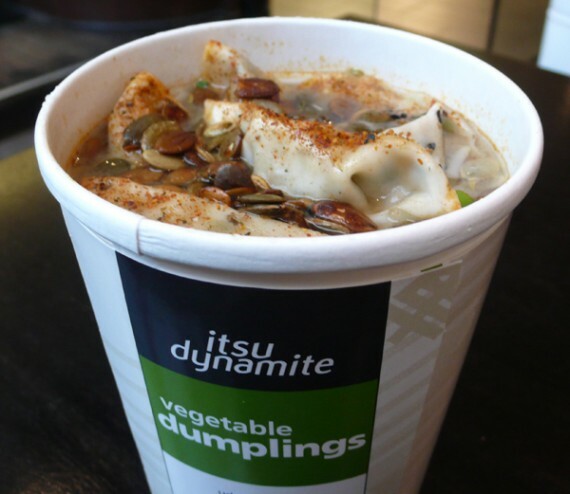 we always make sure to hit up itsu at least once when in london for their delicious dumpling soup…we even like it so much, we figured out how to make it at home here in los angeles. when ordering the dumpling soup off the menu, be sure to specify that you want it with miso broth. the miso broth is vegan, while some of the other soups at itsu contain bonito (fish). although you can’t see them in the picture, the vegetable dumpling soup comes packed with fresh vegetables including spinach, mushrooms and bean sprouts, all atop a big pile of fat udon noodles and stacked with plump and juicy vegetable dumplings and crunchy seeds. 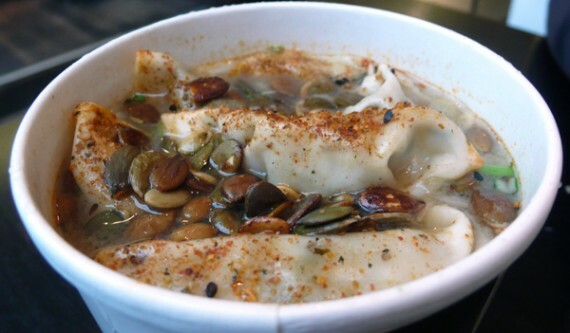 everything that’s shoved into this soup is fresh and amazing, my only tip would be to eat the dumplings first because if they get too soggy they start to disintegrate. this stuff is so bloody yummy, it will have you wondering why you haven’t been eating it every day for years. seriously, so simple and so good. in addition to a really stellar vegan soup option (don’t forget to specify that you want vegan miso broth! 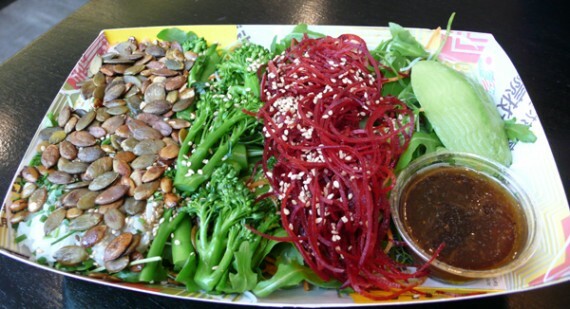 ), itsu offers a damn good salad. the hip and healthy is packed delicate leaves, perfectly prepared vegetables, hearty seeds and even fluffy white rice. it’s seriously a produce lover’s dream…all so fresh and tasty. while the vegetable dumpling soup with miso broth is by far the best thing i’ve ever tried at itsu, the hip and healthy salad is a perfect choice if you don’t want to stagger out with half a gallon of liquid in your belly. to sum it up, itsu is a great choice if you are looking for a nourishing and tasty vegan meal in london. it’s one of our regular uk haunts, and i always feel energized and guilt-free, even after eating a ton. the japanese have got the healthy and simple food down. eating this food will make you feel so good, you won’t even miss the fried and greasy chips or oil-filled indian food. 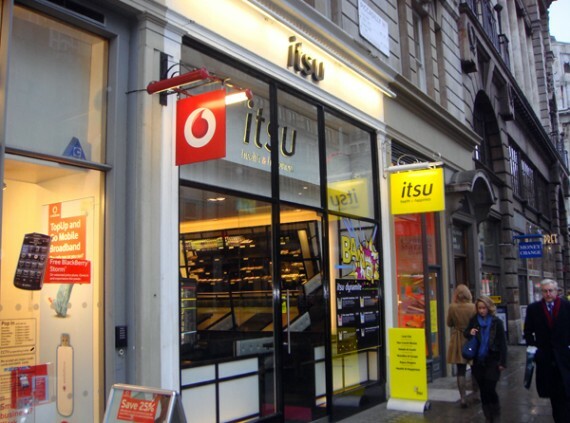 one thing to look out for, if you are eating in and not getting your food to go…be sure to hit up one of itsu’s SHOP locations, not one of the RESTAURANTS. the shops are quick with a vegan-friendly menu and have cute little booths to eat at. 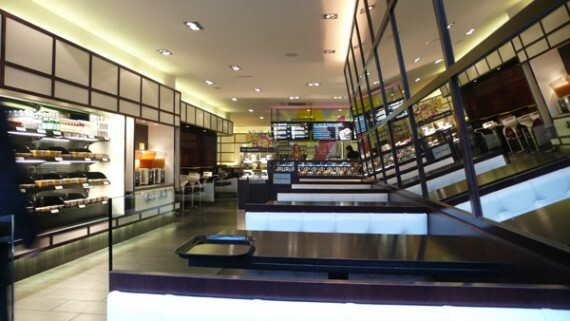 the restaurants are larger and offer a mainly fish menu, with the soups and salads only available for takeaway. basically don’t bother with the restaurants. check out the itsu website for all the shop locations…they are seriously scattered all over london. the pix in this post are all from the piccadilly shop. address and hours below. so hit up itsu! because as they say, “you can eat lots without guilt, sorrow, and pain”! woo! One thing you didn’t mention in your recipe for the udon gyoza soup is that you put a ton of shichimi (Japanese seven spices chili powder) on your soup! That looks really hot! You can get shichimi at most grocery stores in LA like Ralphs. I’ve looked on the website and it says the vegetable dumplings are not suitable for vegetarians, never mind vegans!